The storyline that has been sold to the public by the Federal government, Wall Street, and the corporate mainstream media over the last two years is the economy is recovering and the banking system has recovered from its near death experience in 2008. Wall Street profits in 2009 & 2010 totaled approximately $80 billion. The stock market has risen almost 100% since the March 2009 lows. Wall Street CEOs were so impressed by this fantastic performance they dished out $43 billion in bonuses over the two year period to their thousands of Harvard MBA paper pushers. It is amazing that an industry that was effectively insolvent in October 2008 has made such a spectacular miraculous recovery. The truth is recovery is simple when you control the politicians and regulators, and own the organization that prints the money. A systematic plan to create the illusion of stability and provide no-risk profits to the mega-Wall Street banks was implemented in early 2009 and continues today. The plan was developed by Ben Bernanke, Hank Paulson, Tim Geithner and the CEOs of the criminal Wall Street banking syndicate. The plan has been enabled by the FASB, SEC, IRS, FDIC and corrupt politicians in Washington D.C. This master plan has funneled hundreds of billions from taxpayers to the banks that created the greatest financial collapse in world history. The authorities had a choice. This country has bankruptcy laws. The criminally negligent Wall Street banks could have been liquidated in an orderly bankruptcy. Their good assets could have been sold off to banks that did not take their extreme greed based risks. Bond holders and stockholders would have been wiped out. Today, we would have a balanced banking system, with no Too Big To Fail institutions. Instead, the years of placing their cronies within governmental agencies and buying off politicians paid big dividends for Wall Street. Their return on investment has been fantastic. In April 2009 the FASB caved in to pressure from the Federal Reserve, Treasury, and Wall Street to suspend mark to market rules, allowing the Wall Street banks to value their loans and derivatives as if they were worth 100% of their book value. The Federal Reserve balance sheet consistently totaled about $900 billion until September 2008. By December 2008, the balance sheet had swollen to $2.2 trillion as the Federal Reserve bought $1.3 trillion of toxic assets from the Wall Street banks, paying 100 cents on the dollar for assets worth 50% of that value. In November 2009 the Federal Reserve and IRS loosened the rules for restructuring commercial loans without triggering tax consequences. Banks were urged to extend loans on properties that had fallen 40% in value as if they were still worth 100% of the loan value. By December 2008 the Federal Reserve had moved their discount rate to 0%. For the last two years, the Wall Street banks have been able to borrow from the Federal Reserve for free and earn a risk free return of 2%. The Federal Reserve has essentially handed billions of dollars to Wall Street. When it became clear in October 2010 that after almost two years of unlimited liquidity being injected into the veins of zombie banks was failing, Ben Bernanke announced QE2. He has expanded the Fed balance sheet to $2.6 trillion by injecting $3.5 billion per day into the stock market by buying US Treasury bonds. Bernanke's stated goal has been to pump up the stock market. While taking credit for driving stock prices higher, he denies any responsibility for the energy and food inflation that is spurring unrest around the world. The Federal Reserve has increased the monetary base by $500 billion in the last three months in a desperate attempt to give the appearance of recovery to a floundering economy. Beginning on December 31, 2010, through December 31, 2012, all noninterest-bearing transaction accounts are fully insured, regardless of the balance of the account, at all FDIC-insured institutions. The unlimited insurance coverage is available to all depositors, including consumers, businesses, and government entities. This unlimited insurance coverage is separate from, and in addition to, the insurance coverage provided to a depositor's other deposit accounts held at an FDIC-insured institution. 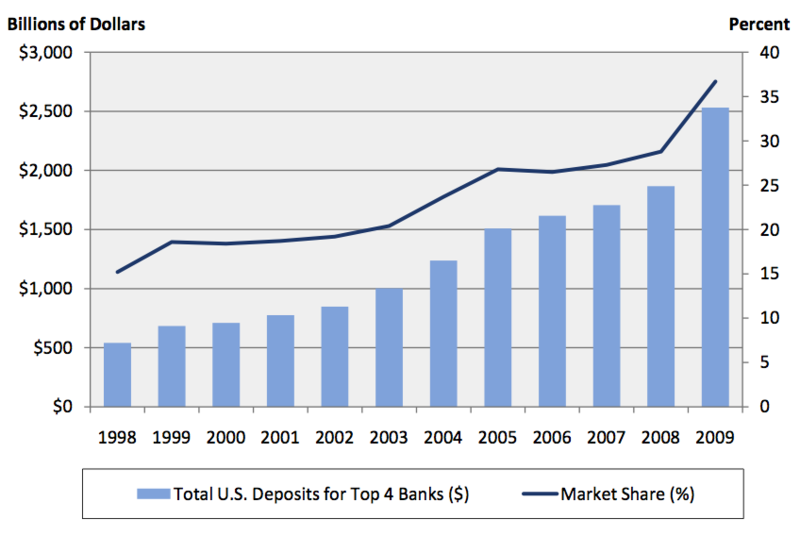 Wall Street banks had absolutely no problem with mark to market rules from 2000 through 2007, as the value of all their investments soared. These banks created products (subprime, no-doc, Alt-A mortgages) whose sole purpose was to encourage fraud. Their MBA geniuses created models that showed that if you packaged enough fraudulent loans together and paid Moody's or S&P a big enough bribe, they magically became AAA products that could be sold to pension plans, municipalities, and insurance companies. These magnets of high finance were so consumed with greed they believed their own lies and loaded their balance sheets with the very toxic derivatives they were peddling to the clueless Europeans. They didn't follow a basic rule. Don't crap where you sleep. When the world came to its senses and realized that home prices weren't really worth twice as much as they were in 2000, investment houses began to collapse like a house of cards. The AAA paper behind the plunging real estate wasn't worth spit. After Lehman Brothers collapsed and AIG's bets came up craps for the American people, the financial system rightly froze up. After using fear and misinformation to ram through a $700 billion payoff to Goldman Sachs and their fellow Wall Street co-conspirators through Congress, it was time begin the game of extend and pretend. Market prices for the "assets" on the Wall Street banks' books were only worth 30% of their original value. Obscuring the truth was now an absolute necessity for Wall Street. The Financial Accounting Standards Board already allowed banks to use models to value assets which did not have market data to base a valuation upon. The Federal Reserve and Treasury "convinced" the limp wristed accountants at the FASB to fold like a cheap suit. The FASB changed the rules so that when the market prices were not orderly, or where the bank was forced to sell the asset for regulatory purposes, or where the seller was close to bankruptcy, the bank could ignore the market price and make up one of its own. Essentially the banking syndicate got to have it both ways. It drew all the benefits of mark to market pricing when the markets were heading higher, and it was able to abandon mark to market pricing when markets went in the toilet. Wall Street desired all the billions of upside from creating new markets for new products. Their creativity knew no bounds as they crafted MBOs, MBSs, CDOs, CDSs, and then chopped them into tranches, selling them around the world with AAA stamps of approval from the soulless whore rating agencies. When the net result of a flawed system of toxic garbage paper was revealed, there was no room at the exits for the stampede of investment bankers. The toxic paper was on the banks' books and no one wanted to admit the greed induced decision to purchase these highly risky, volatile "assets". The trade had not gone bad, the ponzi scheme had unraveled. Suspending FASB 157 has been an attempt to hide this fraudulent business model from investors, regulators and the public. By hiding the true value of these assets, the financial system has never cleared. The banks remain in a zombie vegetative state, with the Federal Reserve providing the IV and the life support system. Part two of the master cover-up plan has been the extending of commercial real estate loans and pretending that they will eventually be repaid. In late 2009 it was clear to the Federal Reserve and the Treasury that the $1.2 trillion in commercial loans maturing between 2010 and 2013 would cause thousands of bank failures if the existing regulations were enforced. The Treasury stepped to the plate first. New rules at the IRS weren't directly related to banking, but allowed commercial loans that were part of investment pools known as Real Estate Mortgage Investment Conduits, or REMICs, to be refinanced without triggering tax penalties for investors.